Another week, another bunch of people punching each other. And kicking each other. And stealing bodies and revenge and….yep – time for another edition of Inspiring Generation Super Fun Drama Chat Time. Cheers! Lore: I have to say – episodes 11 and 12 really brought the gang- political maneuvering to the forefront. I kind of liked it – especially the fight for the body (why does that sound so wrong? Oh yeah- cause it was). E-Kun: That is what had ??? ?’s in my eyes. I feel like the show has made a shift but we do not have all the rules and so I felt in the dark. Not to mention how disrespectful it was for them to continually fight over a dead body, I was a little annoyed. 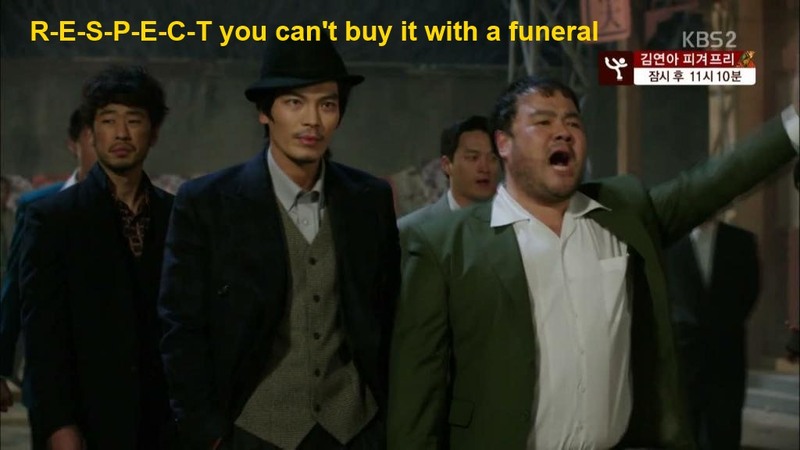 Perhaps you can explain it better, whoever hold the funeral for Jung Tae’s Aboji becomes the owner of the Shanghai Club? Why? Lore: This is what I got from it: Shanghai Club was run by Aboji (who also had control of the street of drunks / the downtrodden). Whoever holds the funeral shows they are the successor to Aboji, so they will have the support of the people. They need the support of the people in order to control the street and the club. And it was disrespectful to fight over the body- completely agree on that. I guess what got me interested was the fact that we finally saw some plotting that did something. Gaya and her plotting versus the Chinese gangsters (but my gosh- did everyone up and forget while they were fighting over the body that it belonged to Jung Tae to begin with!). I like some underhanded schemes, so I kind of got into the story a bit the last two episodes as opposed to say, episodes 9 and 10 (which just made me bitter). But yeah- the tone and direction of the show has changed. That much is evident. E-Kun: But now that Jung Tae arrived, I don’t see the people giving respect to anyone but him. People are not stupid, they are not going to just give allegiance to anyone. Like Jae Hwa got the body, but the people were like, “……..” because they know he don’t care about them, like the Chinese gang, or Japanese gang. They want Jung Tae because he is his father’s son. Lore: True. The people aren’t going to give them respect but they think they will. Lore: It did drag on. And on. And on. What I was kind of WTF over was that the Chinese didn’t immediately figure out that Jae Hwa would switch out the bodies. Like really?! I could have seen that coming. Hyun Joong as an actor has really grown. So, do you know what my absolute favorite moment was from the last two episodes? E-Kun: Is it when Ok Ryeon told Jung Tae that they never were going to happen? That was one of my favorites. I gave her a high five in my head. E-Kun: I know!!! He got a haircut! I did scream when I saw him. I heard that Jae Rim is not returning to the show either. Someone (not a reliable source) said that his character Mo Il Hwa has served his purpose. Lore: Let me digest that piece of news for a second. Lore: NOOOOOOOOOOOOOOOOOOOOOOOOOOO! Okay, done digesting. What the heck! I thought his character would show up in Shanghai soon. I was really looking forward to it. This show certainly knows how to dangle the awesome in front of me and then snap it away as soon as I reach for it (assuming this rumor is true). E-Kun: I am not sure if it is true, but that is what I heard while reading around. Lore: If it is true, my comment stands. 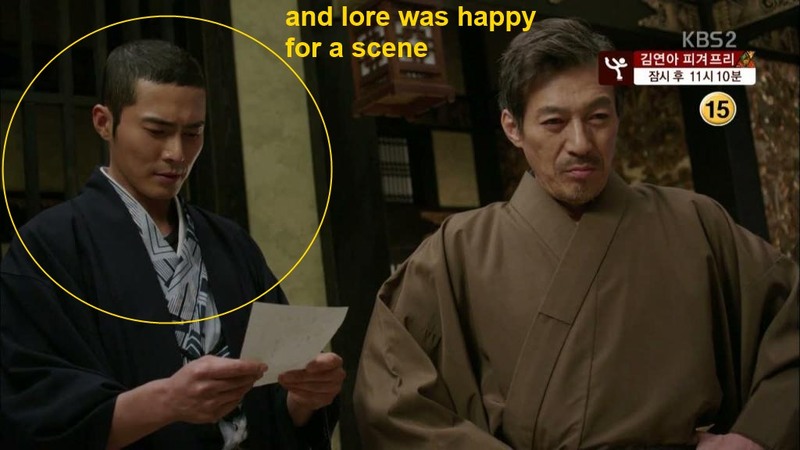 Lore: Jung Tae- Um, yeah. So…I still don’t care. Ok Ryeon- You have grown in the last 5 years. Gaya- Good job with the scheming. Ninja- Come back, permanently! Show- I am still mad at you, and I do not think our relationship will be repaired unless something amazing happens on your part. E-Kun: HA! Jung Tae, Gaya, and Ok Ryeon- I still do not care about you on the grand scheme. 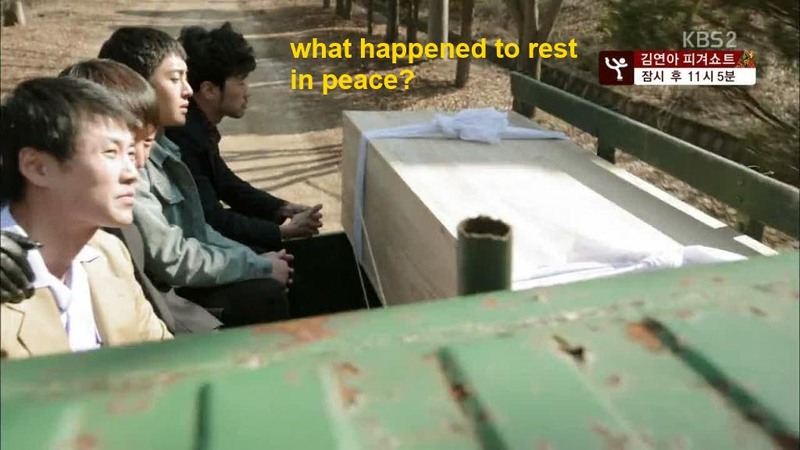 Jung Tae’s Aboji- I am glad they finally buried your body. Show- you seem to be going somewhere, but we need the rules to follow along. I am still trying to be open minded about what you are trying to sell (even though we are halfway through the show now. That is past Ekun’s courtesy timeframe). If the No Mo rumor proves true, I’m done. He was very…inspiring. 😉 He has cause a very interesting scenario to occur in my head that I have filed away for future use if I ever get my writing (fiction) groove back again. I’ll absolutely let you know. Maybe I’ll write a short story, or a vignette, it’s burning in my brain. There is no way I’m writing a novel length anything anytime soon.